I was going to color this a little more, but then I couldn’t find my markers and I got caught up in some little crises (related to the drafts of two papers which were/are due this past week), and I decided to just go with it. (Barthes, Roland. From S/Z: An Essay. New York: Farrar, Straus, and Giroux, 1974. 3-5.) Very pretty, but kind of incomprehensible, huh? When I asked, I was told that he meant “highbrow texts,” but I don’t think that’s right–hence my answer about “tweets.” However if anyone has a good explanation I’m willing to listen. 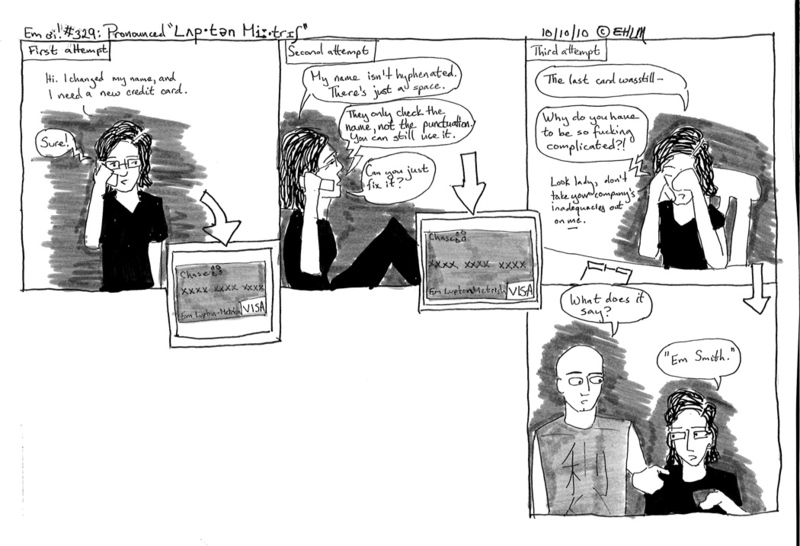 This comic is filed under: PQ94 .L86 2010, for French literature–Literary history and criticism–Criticism–By period–20th century–Treatises. Theory. History. Next week I’ll be funnier. Author adminPosted on October 26, 2010 Categories comicsLeave a comment on Looking for the comic? I had originally written that I was only seven inches shorter than Bryan (he is six feet even, I am 5′ 3″). That is clearly wishful thinking. Luckily (?) he caught it before we went to print (or, before I went to school and scanned this). 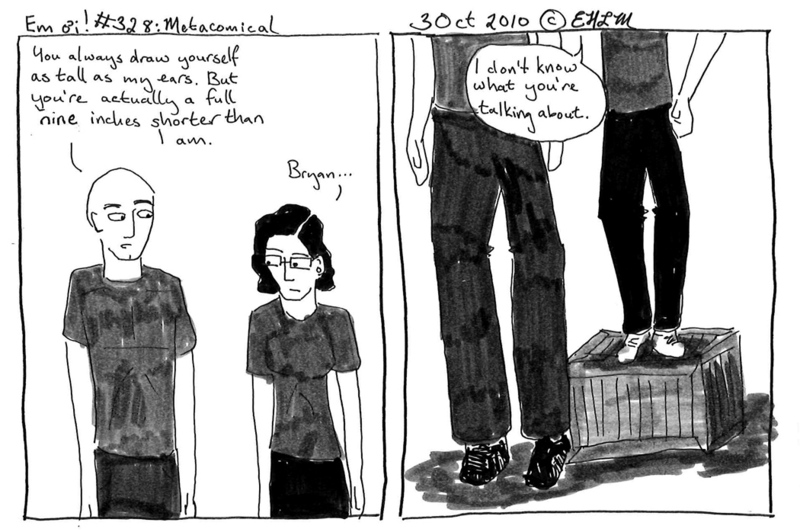 I’ll file this comic under BF697.5.S43 L86 2010 for Psychology—Differential psychology. Individuality. Self—Special aspects, A-Z—Self-perception. Sadly, if LC has a heading for “Napoleon Complex,” I can’t find it. In other news, I’m back to running. Don’t tell my PT guy. I’m kidding (sort of). I’m just running more than his “build up” plan would want me to be doing…but I am taking it relatively easy. Considering that I could do more than a half marathon without feeling sore before all this started, I’m pretty surprised when I’m aching after a five miler. My muscles and lungs are still in shape…my ligaments are evidently now used to biking. I guess it’s not about what I could do, it’s about focusing on the fact that I am allowed to run and have been doing so pain-free. But this is pretty hard.